As early as 08:00 hrs on Wednesday, MDC Alliance supporters had already started gathering at Morgan Tsvangirai House, formerly Harvest House, in their party regalia. They blocked Nelson Mandela St chanting slogans, and anti-riot police in full protective gear assessed the situation but did not engage. The MDC-T supporters, after Biti had announced Chamisa's electoral 'victory', were demanding that Chigumba immediately announce the presidential election results. "Chigumba, stop stealing the people's victory," they chanted but after 13:00 hrs, when again the Zimbabwe Electoral Commission (Zec) chairperson failed to announce the presidential results as earlier promised, people began to be restless. Chigumba had later decided to first invite the 23 presidential candidates' agents to come and verify the results from all centres before the final results could be announced, but this did not placate the restless crowds. The opposition supporters then began to march towards Zec's offices. Police closed the gates, but the agitated opposition supporters were undeterred, massing at the gates and chanting that Chigumba must announce the results. Police threw teargas canisters, and the MDC Alliance supporters stoned the Zec offices. The water cannons (trucks) temporarily dismissed the crowds from the gates, and they fled along Jason Moyo Avenue towards Roadport bus terminus. They burnt tyres on the roads, creating an ominous blaze of fire and smoke. At Rezende St, it was all smoke and fire as police battled to control the crowds. The moment the water cannons retreated, the demonstrators made their way back to Zec's gates again, throwing stones. Though most shops had closed by midday, protestors stoned windows, some looted goods, with street vendors' wares not spared either. Harare went up in a ball of fire, smoke and teargas with some demonstrators getting a ride on a police truck but not as detainees. This sparked wild celebrations that the police were on the protestors' side. But this bubble of calm in the centre of chaos was burst by a staccato of live ammunition as the army, descended on the CBD. Some gory pictures of a man in a black t-shirt lying in a pool of blood and other protestors trying to stem the flow of blood from a dreadlocked man's stomach signaled the horrible turn events. Armored trucks chased after the protestors, spraying a fusillade of shots. But the real painful moment was seeing an adult woman, who was coming from work, lying lifeless on the street having been shot by a bullet from the back. 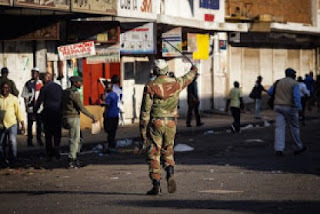 Harare had turned into a killing zone, punctuated by a staccato of gunfire, the chants of soldiers and pounding feet as people ran for dear life. Innocent workers who had been in town had to literally run for cover as the soldiers ordered that people disperse. Kombis were parked a kilometre or more from their usual terminuses and along the way, soldiers were beating people at will.